The new Church of Scientology Twin Cities Ideal Organization was dedicated October 22, 2011, in ceremonies attended by more than 1,000 Scientologists and their guests. Mr. David Miscavige, Chairman of the Board Religious Technology Center and ecclesiastical leader of the Scientology religion, was joined by civic leaders and government officials to commemorate the opening of the first Ideal Church of Scientology in the Midwest. The ceremony dedicating the new Church of Scientology Twin Cities, October 22, 2011, opened with a stirring rendition of “Will You Be There” performed by award-winning gospel group, The Steeles. The Church of Scientology Twin Cities celebrated completion of their landmark building’s renovation, formerly the Science Museum of Minnesota, in downtown St. Paul. 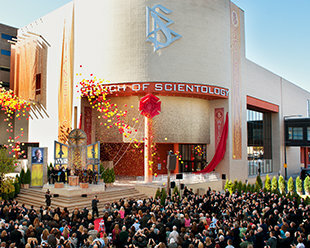 Scientologists, guests, neighbors as well as leading city and state officials convened for the dedication and opening. 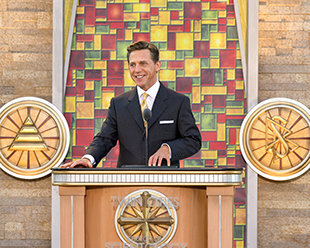 In tribute to the import of the occasion, Mr. David Miscavige, Chairman of the Board of Religious Technology Center and ecclesiastical leader of the Scientology religion, officiated at the ceremony, October 22, 2011. In pointing to the significance of the day, Mr. Miscavige cited all that new Ideal Churches of Scientology traditionally bring to their surrounding communities, pledging the Church's resources and support across a broad range of civic programs for the benefit of all citizens. Thus, by dedicating a new Church for Minneapolis and St. Paul comes the inauguration of a new partnership in Twin Cities. Mr. David Miscavige, Chairman of the Board Religious Technology Center and ecclesiastical leader of the Scientology religion, dedicated the new Church of Scientology Twin Cities with, left to right: President of Minneapolis MAD DADS, Mr. V.J. Smith; Minnesota Senator Sandra Pappas; Minnesota Representative Rena Moran and City Councilmember Dave Thune. Thousands of Scientologists and guests toured the café of the new Church of Scientology Twin Cities, dedicated October 22, 2011. The café is conveniently located just off the grand reception of the Church of Scientology Twin Cities. It provides snacks and refreshments to both parishioners and visitors. Thousands of Scientologists and guests toured the Chapel of the new Church of Scientology Twin Cities, dedicated October 22, 2011. The Chapel serves parishioners and guests for Sunday services, weddings and naming ceremonies. The original 300-seat IMAX Theater, further serves as a venue for a wide range of community events. The new Church of Scientology Twin Cities stands at 505 Wabasha Street in the heart of downtown St. Paul. The landmark building is the former home of the Science Museum of Minnesota and now serves as the first Ideal Church of Scientology in the Midwest. The Church of Scientology Twin Cities grand reception is the welcoming point for all who enter the Church. Here, visitors will find an array of introductory books and Public Information Displays presenting the fundamental beliefs and practices of Dianetics and Scientology as well as the life and legacy of Founder L. Ron Hubbard. The Church of Scientology Twin Cities Public Information Center presents informational films introducing Dianetics and Scientology, the Church’s many humanitarian and community outreach programs, as well as the life and legacy of Scientology Founder L. Ron Hubbard. Just off reception is a lounge and fireplace in true Minnesota style, offering a warm welcome to all who enter the Church. The Chapel of the new Church of Scientology Twin Cities, dedicated October 22, 2011, serves parishioners and guests for Sunday services, weddings and naming ceremonies. The original 300-seat IMAX Theater, further serves as a venue for a wide range of community events. The L. Ron Hubbard legacy comprises tens of millions of published words, recorded lectures and films on the mind, life and spirit. These materials are available to parishioners and newcomers alike. Mr. Hubbard’s beginning library is available in 50 languages. The café is conveniently located just off the grand reception of the Church of Scientology Twin Cities. It provides snacks and refreshments to both parishioners and visitors. L. Ron Hubbard developed the Purification Program to free individuals from the mental and spiritual devastation caused by drugs. The Purification Center features an iconic tile and stone mural depicting the bridge connecting St. Paul and Minneapolis. Scientologists study a series of courses to train as auditors (spiritual counselors). Auditors apply the technologies of Dianetics and Scientology to help others attain spiritual freedom. Scientologists, guests, state and city officials assembled in downtown St. Paul, Saturday October 22, for the dedication of the new Church of Scientology Twin Cities. The Church stands at 505 Wabasha Street and was formerly home to the Science Museum of Minnesota. The acquisition of the 82,000-square-foot facility in the heart of St. Paul was necessitated by the meteoric growth of the resident Scientology community. The Church of Scientology Twin Cities is now the largest Scientology facility in the American Midwest and will serve parishioners from Wisconsin to the Dakotas. Mr. David Miscavige, Chairman of the Board of Religious Technology Center and ecclesiastical leader of the Scientology religion, dedicated the new Church of Scientology Twin Cities. Located just blocks from the State Capitol and St. Paul’s Cathedral, the Church is additionally adjacent to the famed Fitzgerald Theater and so forms an “historic square” of buildings in downtown St. Paul. The premises were carefully renovated to preserve its most memorable features, including the floor-to-ceiling windows overlooking Wabasha Street and the three-story atrium. Also faithfully preserved was the original 300-seat IMAX Theater, now to serve as the Scientology Chapel and community meeting ground for citizens of all denominations. Just off the expansive reception is a Public Information Center presenting the beliefs and practices of the Scientology religion as well as the life and legacy of Scientology Founder L. Ron Hubbard. The Information Center further provides an overview of the many Church-sponsored humanitarian programs. These programs include a worldwide human rights initiative, an equally far-ranging drug education and prevention campaign, global networks of literacy and learning centers and the Scientology Volunteer Minister program now comprising the largest independent relief force on Earth. The multimedia displays include nearly 500 documentary films. The new Church of Scientology Twin Cities Ideal Organization was dedicated October 22, 2011, in ceremonies attended by more than 1,000 Scientologists and their guests. In tribute to the import of the occasion, Mr. David Miscavige, Chairman of the Board of Religious Technology Center and ecclesiastical leader of the Scientology religion, officiated at the ceremony. In pointing to the significance of the day, Mr. Miscavige cited all that new Ideal Churches of Scientology traditionally bring to their surrounding communities, pledging the Church's resources and support across a broad range of civic programs for the benefit of all citizens. Thus, by dedicating a new Church for Minneapolis and St. Paul comes the inauguration of a new partnership in Twin Cities. Welcoming the new Church were St. Paul City Councilmember Dave Thune; Minnesota State Senator Sandra Pappas; Minnesota State Representative Rena Moran; and President of the Minneapolis Chapter of MAD DADS (Men Against Destruction Defending Against Drugs and Social Disorder), Mr. V.J. Smith.